I deliberately started the coastal part of the drive home from Eden as we have never travelled the South coast before. The highway and the coastal towns are reminiscent of the Pacific Hwy and the NSW north coast 10 years ago before the highway upgrades. On the advice of the man behind the counter in the Moruya petrol station I drove the short stretch of coastal road from Moruya to Bateman’s Bay and stumbled upon this photographic gem – Jimmy’s Island in Guerrilla Bay. You may have noticed that I have taken a liking to extra wide panoramas and long exposures (2 seconds in this case). I know some people think it is overused but in this case I think the blurred detail and the motion that the longer exposure invokes work well against the sharp angles and colours of the island. Thoughts? I counted at least a dozen memorials on the Hume between Sydney and Goulbourn and I think we all know of one or two that we pass regularly. 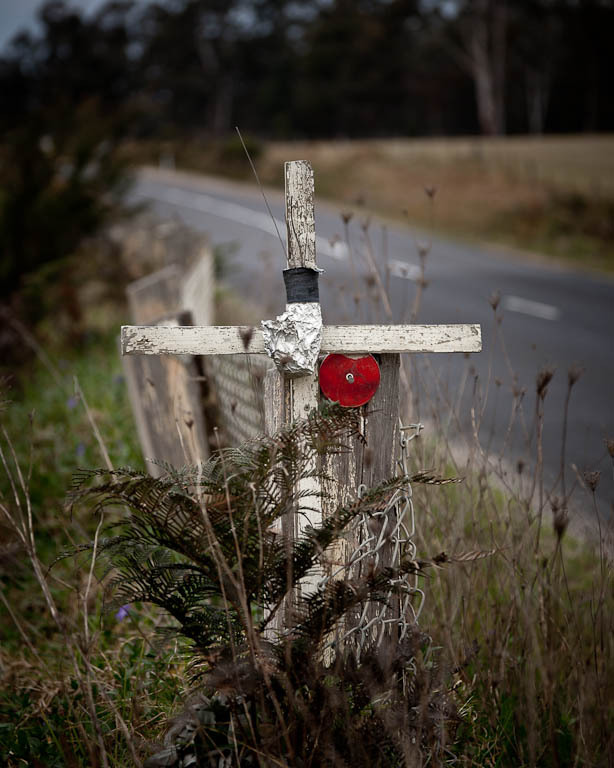 They represent such powerful stories and I think a photographic series on roadside memorials would make a great portfolio. I will try it soon as it something I could tackle to get me out of my landscape comfort zone. In this example the red reflector reminds me of a Flanders poppy, which itself holds a strong meaning, and the anonymity of the marker suggested the latitude/longitude reference.